Justice with @JudgeJeanine tonight on #FoxNews will feature the #MorganHarrington case and @HelpSaveTheNextGirl. 9pm EST. Metallica has recorded a public service video for the FBI to help law enforcement officials in Virginia catch a man who is suspected of killing a Virginia Tech student after one of the rock band's 2009 concerts. In it, Metallica lead singer James Hetfield asks fans to assist Virginia State Police in their investigation into the death of Morgan Harrington, 20, who disappeared after a concert in Charlottesville. Harrington's remains were later found in a field 10 miles away. The band is also offering a $50,000 reward for information leading to an arrest in the case. The suspect has been linked by DNA to a similar assault on a woman in Virginia, Hetfield said. According to the Associated Press, a woman walking home from a grocery story in 2005 "reported being grabbed from behind, dragged behind a maintenance shed and attacked." A composite sketch of the suspect described by the woman in the 2005 attack is shown in the public service announcement—all part of an advertising blitz launched Wednesday by the FBI and local law enforcement. Posters featuring the sketch and reward offer are being distributed at bus shelters along the East Coast, the FBI said. Pueng Vongs contributed to this report. Bumping up, nothing new. I like to read Mrs. Harrington's posts. A fine and courageous woman. 241. You are not forgotten. The "America's Most Wanted" segment on the unsolved slaying of Virginia Tech student Morgan Harrington is generating tips for investigators. Virginia State Police received at "six or seven" new tips after the show aired Friday, said police spokeswoman Corinne Geller. Wednesday marks the three-year anniversary of Virginia Tech student Morgan Harrington's disappearance, and her parents returned to the last place she was seen in Charlottesville to keep her case fresh in the public's eye. The Harringtons joined police and close friends to remember Morgan, who was last seen on the Copeley Road Bridge in Charlottesville on Oct. 17, 2009, during a Metallica concert. "Three years ago, Morgan Harrington walked on this bridge and she was confused, hurt and she intersected with evil," Morgan's mother, Gil Harrington, said. The body of the 20-year-old Virginia Tech student was found on a farm in southern Albemarle County in January 2010. Her parents join police in searching for the unknown suspect. "This is a home-grown predator. Local boy. He knows this community well. He's very familiar with this community," Gil Harrington said. Virginia State Police have released a sketch of a man linked to Harrington's disappearance by DNA from a 2005 sexual assault in Fairfax. "We will not forget and will not let others forget that an unsolved murder remains in this community," Dan Harrington said. The Harringtons mark the anniversary of Morgan's disappearance each year by visiting the Copeley Road Bridge. They're convinced this is the final year they'll have to make the trip to Charlottesville. "Let's make this be the last time we meet in this way," Gil Harrington told the crowd who gathered to hear the couple speak. "I'll meet you out front of the courthouse next time we have an arrest. That's what I'm looking forward to." There is still a $150,000 reward for any information that leads to an arrest. The Harringtons say they want to find their daughter's killer through tips, not through DNA from another homicide. The former lead investigator into the 2009 abduction and death of Morgan Harrington has released a letter pleading for the person who has information on the case to come forward. Lt. Joe Rader retired from the Virginia State Police earlier this year. Harrington disappeared on October 17, 2009, after attending a Metallica concert at John Paul Jones Arena in Charlottesville. Her remains were found in January 2010 on a farm in Albemarle County. As the Hokies rallied against the Cavaliers Saturday, they also rallied around the family of murdered Virginia Tech student Morgan Harrington and the Help Save the Next Girl campaign. It has been three years since Morgan Harrington was murdered after leaving a concert at John Paul Jones Arena in Charlottesville, But Saturday in Blacksburg, her peers and her school showed that she is not forgotten. Virginia Tech players wore bracelets supporting the Help Save the Next Girl campaign. The athletic department donated seats to the Harrington family. Morgan's father, Dan Harrington, wore a patch with a special meaning for his family. Hokie Head Coach Frank Beamer wore a patch with ‘2-4-1' dots, matching the one Dan Harrington wore in the stands. Metallica are one of the most stringent bands when it comes to usage of their trademark, which makes the new Virginia Tech ‘Enter Sandman’ shirts something truly special. The group gave the school permission to print the shirts with the idea that the money raised would go to the Morgan Harrington Scholarship Fund. December 1, 2012Now, Metallica — who had previously offered a massive reward for information leading to her murderers — have partnered with the Virginia Tech university bookstore to produce an “Enter Sandman” shirt. The band’s share of all shirts sold will benefit the Morgan Dana Harrington Scholarship Fund. Reports claim the first month of sales of the shirt generated $17,000 for the fund. The Virginia Tech bookstore will be able to sell the shirts until at least next football season. After that, Metallica and the bookstore may choose to extend the partnership. It's been more than three years since Virginia Tech student Morgan Harrington vanished after a Metallica concert at the John Paul Jones Arena (JPJ) in October 2009. Now, a civil lawsuit filed against the company that provided security during the concert is being transferred to Charlottesville. Charlottesville attorney Lee Livingston is taking over the suit filed against Regional Marketing Concepts, Inc., the security company that worked the Metallica concert the night Harrington disappeared. Livingston says Arthur Strictland, a friend of the Harrington's, filed the lawsuit in October 2011. The suit blames the security company, saying the security guards should have realized Harrington was hurt and offered her help. A $3.5 million lawsuit between Morgan Dana Harrington’s parents and the company that provided security at the 2009 concert at the John Paul Jones Arena has been transferred to Charlottesville Circuit Court. The papers have been served to the defendant, but no court dates have been scheduled in the matter. 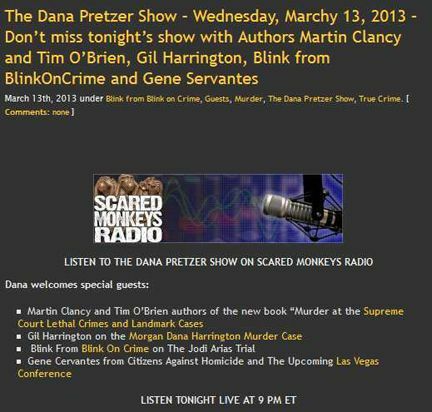 DON'T MISS TONIGHT'S DANA PRETZER SHOW AT 9PM ET! Listen to podcast to hear Gil Harrington regarding Morgan's death. UPDATE: What 911 dispatchers initially confirmed was an attempted abduction Monday night in Albemarle County is now being investigated as a suspicious circumstance. Page created in 7.176 seconds with 19 queries.